Khadamat Facilities Management LLC is a joint venture (JV) company formed to operate the new UAE University Campus in Al Ain. Welcome to Khadamat Facilities Management, the provider of Integrated Facilities Management Services to the United Arab Emirates University, Al Ain. Khadamat Facilities Management LLC is a joint venture (JV) company formed to operate the new UAE University Campus in Al Ain. 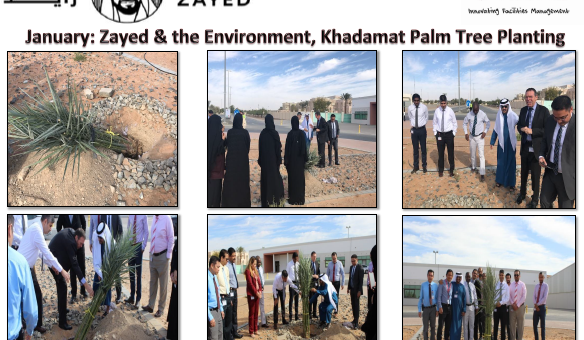 Khadamat staff are looking forward to tasting the fruits from this prestigious palm tree which was planted as part of the Khadamat Year of Zayed Program. Many members of staff actively took part in the tree planting ceremony and special thanks to the Khadamat PRO Mohamed Abdulla for donating the tree.